U.S. Sen. Marco Rubio, R-Fla., stumps for Rep. Rodney Davis during a rally Monday, Oct. 29, 2018, in Uptown Normal. Sen. Marco Rubio rallied Central Illinois Republicans behind Rep. Rodney Davis on Monday, calling him an effective, moderate voice in a country filled with political extremism. The Florida senator and one-time presidential candidate was the headline speaker for a GOP rally at the Uptown Normal Marriott Hotel and Conference Center. 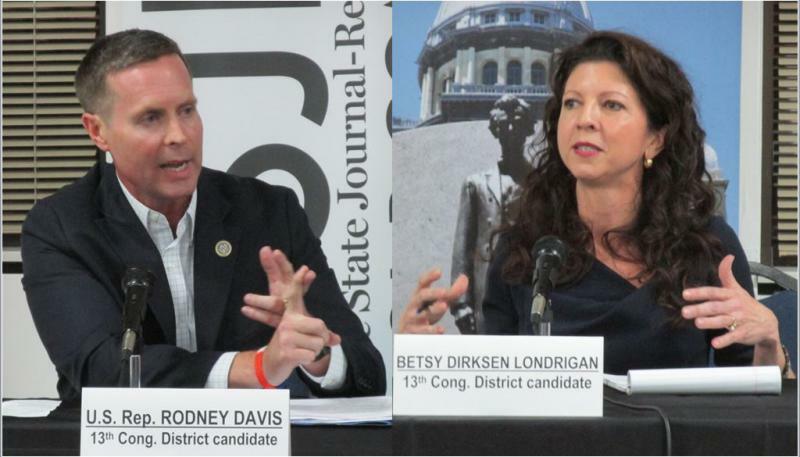 Billed as a watch party for the GLT debate featuring Davis earlier Monday evening, it looked more like an all-hands-on-deck moment for Central Illinois Republicans looking to withstand a possible Democratic blue wave. Rubio spoke in front of a pack of Republican officeholders in county, state, and federal government. He said Davis was a leader on issues like workforce training. That’s a reference to Betsy Dirksen Londrigan, the Democratic challenger looking to unseat Davis on Nov. 6. Davis debated Londrigan on Monday night just next door at the Normal Theater. Davis is one of the top targets nationally for Democrats looking to win two-dozen seats and take the House majority. Davis represents the sprawling 13th Congressional District, a mix of college towns and rural areas that was drawn by Democrats to give a Democrat the chance to win. Analysts say it leans Republican. Davis endorsed Rubio during the 2016 Republican presidential primary. Rubio returned the favor Monday with a 19-minute speech to a ballroom filled with Davis supporters. “We do have an obligation to lead by example. No matter what people might say about us. … We should always do so in a way that hopefully sets a standard and an example for our nation. And Rodney does. At a time when far too many don’t. He is one of those guys who’s able to lead passionately for the principles that matter, that are good for our country, but do so in a way that those who support him can be proud,” Rubio said. Rubio began Monday in Chicagoland, stumping for another House Republican facing a tough re-election challenge: Rep. Peter Roskam from the western suburbs. By Monday night, he was on stage with Davis and fellow House Republicans Rep. Adam Kinzinger, a Bloomington-Normal native, and Rep. Darin LaHood from Peoria. Rubio said Davis deserved support, even from those who don’t agree with 100 percent. Londrigan brought her own heavy-hitter to Bloomington-Normal on Monday. She was joined by Rep. Cheri Bustos, a Democrat from western Illinois and a rising star in her own party, for a midday rally at Illinois State University. Editor's note: A GLT reporter covering Rubio's event was asked to wear a Davis sticker to enter the ballroom.